OAK LAWN, IL MAY 12, 2014 — AT&T Illinois today announced an Oak Lawn social service non-profit, Park Lawn, is the winner of an “AT&T Investing in Illinois Award.” Park Lawn is a non-profit organization offering a variety of programs and services for individuals with intellectual and developmental disabilities. 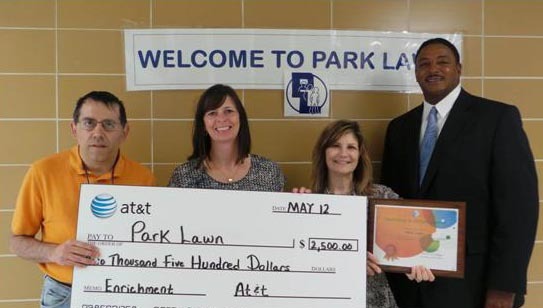 Park Lawn receives public recognition and a contribution of $2,500 from AT&T. The contribution will support Park Lawn's enrichment program designed to enhance community participation, social engagement and the opportunity to learn new skills for individuals with intellectual and developmental disabilities. “At AT&T, we’re investing for today and tomorrow. As our customers continue moving to new Internet-based communications technologies like Internet home phone and wireless, we are investing in next generation communications networks. At the same time, we are also investing in the communities we serve, by making corporate contributions to Illinois non-profit groups and programs that are making a difference locally,” said Sam Balark, AT&T External Affairs Director. State Representative Kelly Burke nominated the organization for the recognition from AT&T Illinois.